Islamic Emirate: Why are defendants of humanity silent over killing of defenseless Afghans!!? The criminal American invaders and their internal stooges in Kabul have left no stone unturned over the last seventeen years in creating a cleavage between the Islamic Emirate and the pious masses of our beloved homeland through their malicious propaganda campaign alleging Taliban are against learning and education and they burn educational institutions and kill teachers. On the contrary, the Islamic Emirate has never been against education either during its reign nor in the current phase of liberating the country from illegitimate foreign occupation. Rather it has struggled hard in facilitating the centers of Islamic and modern studies in all the areas under its jurisdiction. Inevitably it has its own reservations regarding the system and productivity of educational curriculum and program, but it is a totally different and justifiable aspect. As far as the issue of demolishing the educational institutions and hurting students or teachers is concerned, it is solely the task and interest of people and powers who vocally talk about promoting education but in reality are staunch enemies of learning by nourishing a profound hatred against it in their hearts and minds. The most recent proof is the demolishing of an active female educational institute in the heavy and indiscriminate bombing of savage American invaders near Pamir Hotel and Doblo area of Kunduz province in which financial losses and casualties were inflicted on the innocent civilian people. Similarly, according to verified reports another brutality was undertaken in the disguise of night operation by the mercenary in-security forces and notorious Arbaki militia of the puppet regime in Sajawal area of Tarin Kot city, the center of Uruzgan province during which helpless civilian people were beaten under the lame excuse of sympathizing with Taliban and providing them food and shelter. Youngsters were detained and taken away as prisoners besides looting and plundering several houses. During this carnage, some families took shelter in the nearby gardens and orchards to rescue their lives but the unrestrained Arbaki militiamen and the ruthless mercenary forces did not spare these stranded people, mostly women, children and white-bearded persons. They brought the orchards under their heavy and indiscriminate shelling in which twenty innocent helpless people were killed and wounded. Dr. Zia-ur-Rahman, the head of civil hospital in Tarin Kot city told the media that wounded people brought to this hospital were mostly children and women. Our innocent and helpless civilians are deliberately martyred and wounded, their houses are raided and the people are detained, imprisoned and tortured ruthlessly however the organs for the prevention of civilian losses, and regional and international human rights commissions have adopted complete silence by showing no reaction or filing a protest against these felonious acts of the brutal American forces and their ruthless internal mercenary forces. 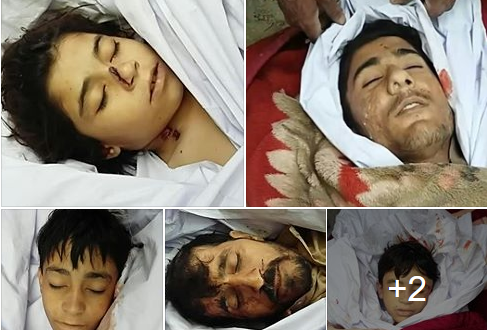 On the contrary, all these organs and commissions are dictated to by the very offenders and regretfully, in the annual report released by UNAMA, most of the innocent civilians killed and wounded are filed and then ignored as armed opponents. In another open survey by Watson, an independent organ, it is clearly cited that more than one hundred thousand civilian Afghans were killed in the indiscriminate air attacks of savage foreign occupying forces during last fifteen years. But the brutal American invaders as well as their internal stooge forces, in their turn, have always blamed the armed opponents for their unjustifiable felonies and in most cases, the civilian people killed or wounded were labelled as Taliban, contrary to all ground facts and figures. Undoubtedly the recent civilian losses and casualties in Kunduz province and Tarin Kot, particularly targeting and demolishing an educational institute are serious crimes against humanity and an explicit violation of all internal laws!! !